Following my previous post of preparing to photograph in cold conditions. One of the biggest challenges I found of photographing in a snowy location was getting around the various snow and ice circuits; as anything away from the driving track was pretty deep snow. 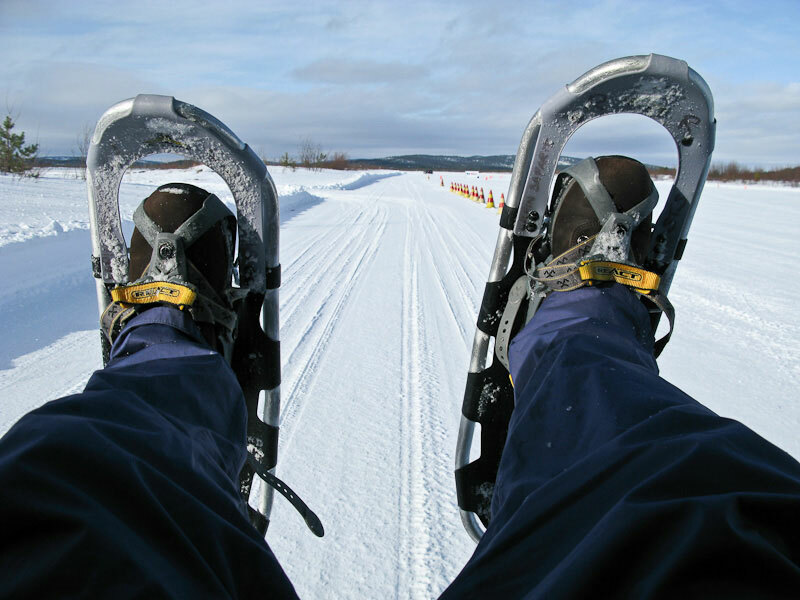 This required the use of snow shoes which was novel for a day, but after that just hard work. One upside though was there was no chance of getting cold, as just walking through deep snow and carrying a heavy back pack with cameras and various lenses was hot and pretty exhausting work. On the first day I scoped out the courses to get my track bearings and to get handle on the best vantage points to see the cars coming around corners at speed and to try to anticipate when most of the action is likely to occur. I wanted to be able to provide images from viewpoints which obviously showed the track, but could easily pass as shots taken from a road side of a typical winter road. Typically of course, these were areas of the course that were only accessible by foot. Weather conditions across the week varied considerably, everything from heavy snow to beautifully crisp blue sky days. The temperature remained fairly constant thorough-out the week and another problem when photographing in this sort of environment is keeping the batteries warm. All batteries suffer in extreme conditions, they drain very quickly and the last thing I needed was a dead camera. Old batteries in particular are hit hardest, so I bought so brand new ones before I flew out and I packed some air activated hand warmers, these last for up to 8hours, although they don’t last that long in very low temperatures and drop off pretty quickly after 5 hours. After I made this video I even took to wrapping the batteries and warmers together in a large cleaning cloth. This ensured that the batteries remained in contact with the warmers. Poor visibility and low contrast played a big part during the week and at times made shooting almost impossible. Thankfully the good days were exceptionally good and we were able to tick a lot off the shoot brief within a fairly short space of time. Photographing the ice straight track. On the fine weather days I concentrated on creating some marketing and advertising images for the client and on the bad weather days I made sure that the guests were more heavily featured. Heavy falling snow causes lots of problems for shooting cars travelling at speed. The light suffers really badly, the resultant scene is extremely flat and with low contrast ambient light it makes it difficult for the camera autofocusing system to nail the focus. It not much fun for the drivers either, on the ice tracks the falling snow was a much bigger problem even a small amount of snow layered on ice makes the track un-driveable and dangerous, so on bad days the ice circuit would have to close. One thing I hadn’t anticipated was the volume of images or data I’d shoot throughout the week. Not having done a great deal of track photography before, on the first day I was shooting in RAW (my default shooting mode) and burst through 25+ gigs of data. First day, yikes!! I wouldn’t be able to sustain that burn rate and I’d run out of back up space fast. I decided I was either going to have to be super concise in my shooting, deleting as I go or start shooting high res JPEG’s. I switched to jpeg to test the scenes exposure latitude and was pleasantly surprised at the results. I had to be super accurate with the exposure but it was a trade off I could live with. My final plan was to shoot all the track and performance testing in High Res JPEG and move back to RAW for the important marketing and advertising work. This worked like a charm and my burn rate dropped to a more sustainable 8-10 Gb’s per day. Tyre performance around the ice circuit. Overall the week long shoot was a huge success, after each day of shooting it’d be back to the hotel to download and backup the images, clean off the cards ready for the next days shooting and if time allowed, quickly process a few up in Lightroom to show the client for the following morning’s review. 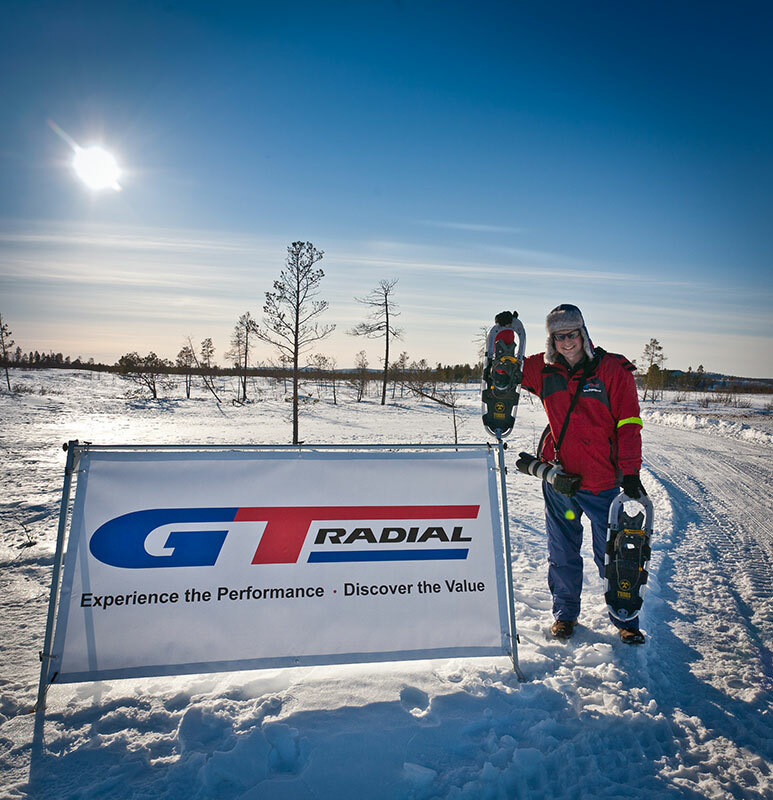 I managed to get some super advertising and marketing shots for GT Radial, which have surpassed their expectations for what was possible on the shoot. When I get the o.k from GT Radial I’ll upload a few of them to show you. I’m be super excited when I they start using them in their marketing material. I’ll keep you posted. In the meantime I’ve got some exposure in the Tyres and Accessories trade magazine, who are running a feature on winter tyres and my images feature pretty highly throughout. Again, when it’s published I’m drop you a link. I’d love to hear your thoughts and if you like the images feel free to ‘Like’ or share the post with others. Until next time.